The day after Friday night's megashow, Bruce Springsteen and the E Street band filed onto the stage at Gothenburg's Ullevi Stadium around 4:30PM for soundcheck. Rehearsal consisted of several runthroughs of “Frankie,” “Where the Bands Are,” and finished up with “Reason to Believe." “Frankie” featured Bruce soloing on electric guitar, which developed on subsequent plays into an extended instrumental outro, with Soozie and Jake helping to round it out. (He and the band were to take the song to new heights during Saturday's night's show.) Nils' part in the final bridge of ”Reason” was also not to be missed, but unfortunately the song didn't make it into the night's set list. Instead, at the end of ”Because the Night” Nils delivered his usual great eardrum crushing guitar solo. Saturday night's show saw some possessed solo-shredding from Bruce, Stevie, and Nils, as well as classic Max Weinberg drumming and an epic series of solos from Jake Clemons, culminating in a heart-stopping delivery of "Jungleland". Other notable tour debut songs included "Saint In the City," and "Lost in the Flood." Ending the night with a thrice-extended version of "Twist and Shout" ("the stadium buster"), Bruce briefly sprayed water at the band as he came off stage, boisterous after the huge three hour and forty three minute performance. 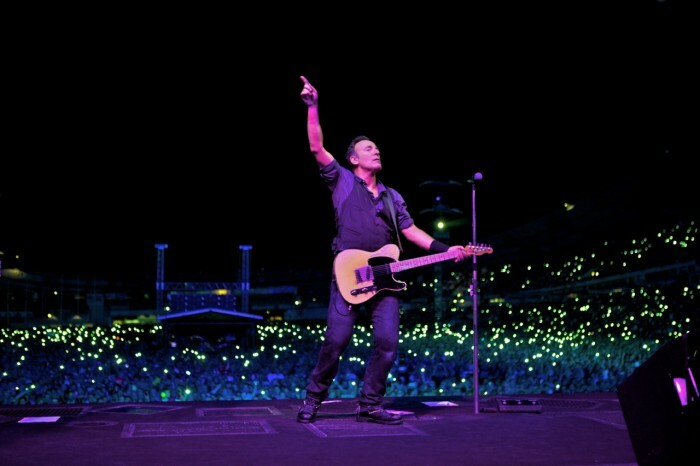 The show is already being heralded as a contender for one of the best ever in Bruce history. As the sun set over the audience while the band played "Frankie," Bruce, inspired by and trusting in the crowd, called out "Let me see those fireflies!" He was rewarded with a sea of flickering cell phone lights, and was clearly honored, saying softly, "Yeah, that looks good." Offstage, Bruce said 'I didn't even know that function existed,' and "I think that's the best we ever played that song." The band's ability to trust in, and be surprised by the audience remains a crucial resource in the E Street equation. Saturday night's show was all about loss and moving forward by 'passing on the torch,' as Bruce put it. Renewal is a powerful thing for this band, and songs like Backstreets and, of course, "Jungleland" were naturally the emotional crescendos of the show. The image of Jake Clemons raising his sax to the sky and pointing upwards burns an imprint into the soul. That the fun continues as all this is going on, with songs like "Ramrod" and "Twist and Shout," gives testimony to that renewal.